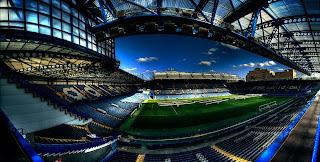 Chelsea chief executive Ron Gourlay hopes to reveal a naming rights sponsor for Stamford Bridge before next season. Gourlay made the announcement on Monday when he also admitted the Blues needed to move to a bigger stadium if they were to fulfil their ambitions of being a European force. Chelsea are exploring options regarding their future headquarters after shareholders in the Chelsea Pitch Owners company rejected a proposal to buy back the land upon which Stamford Bridge is built. That set back hopes of moving away from a stadium Gourlay believes they have "outgrown". In the meantime the club are looking at extra revenue streams, including renaming the stadium they have called home for over a century, as they look to comply with UEFA's impending "financial fair play" rules.